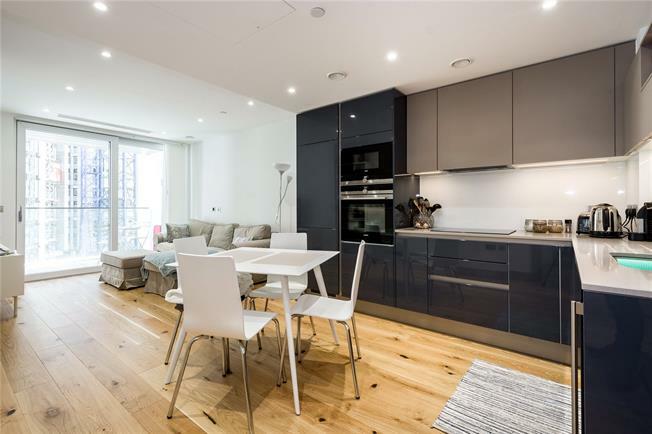 A two bedroom, two bathroom apartment within Paddington Basin's latest development, which completed in 2017. On the fourth floor of the central building of the scheme (Block 2), this apartment is accessed via the residents lifts from the grand double height entrance lobby with concierge and access to the communal gardens behind. Within the flat, all principal room face onto the communal garden (currently under construction), as do the two private balconies. Accommodation comprises: master bedroom with balcony access, dressing area and luxury en-suite bathroom with his and hers basins, second bedroom, open plan kitchen / reception room with second balcony, guest bathroom and storage.